I mentioned yesterday that I am going to be writing all week about my trip to North Carolina last week. Ya, it was just a weekend trip but lots happened. As seems to be our way (in spite of not being at ALL morning people) we were up and out before it was officially morning. Of course the mandatory stop was made for coffee, then we hit the road. Which happened to be a dark road at that hour so we didn’t see much. Anyways, about the time we hit Georgia it started to be light enough to read the billboards. Holy crap, Georgia has a lot of billboards. Just saying. And apparently, though there are pictures of peaches everywhere they have NO PEACHES. I don’t care what time of year it is, the one time I’ve ever been in Georgia shouldn’t they have been selling peaches by the roadside? It could have been canned peaches, I would have been ok with that if they also had can openers. But no. Then, the welcome center that they had been advertising for about a million miles that I was so looking forward to being welcomed at was closed. Really? That’s not very southern hospitable is it? Sorry, squirrel moment. Back to the billboards. Many of them were advertising wineries. I love wineries! Too bad it was 9am. The frog winery (that’s not the exact name, but there was something about a frog in it) didn’t open ’till like 11. Dang! 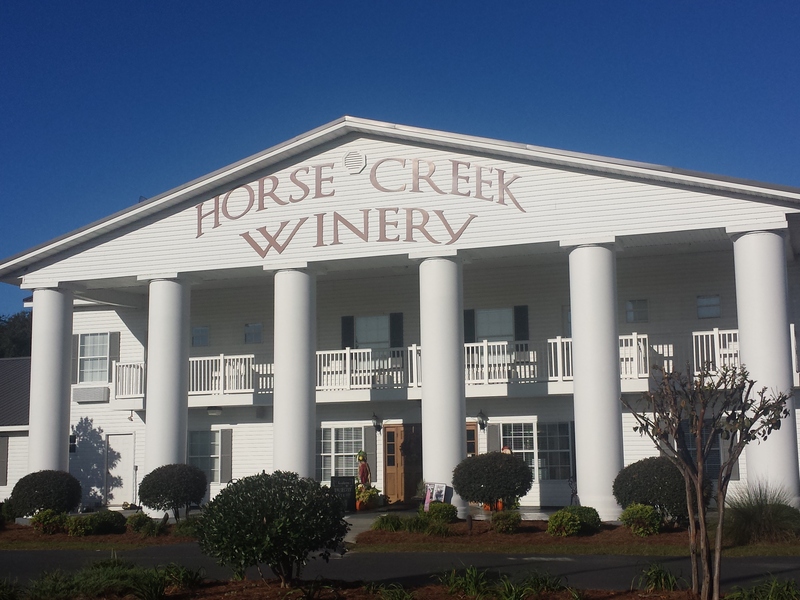 We saw another billboard for Horse Creek Bistro and Winery and decided to stop whether they were open or not. After all, doesn’t bistro mean food? And it was breakfast time. Sadly, it was also closed. How could it be so hard to find an open winery at 9am? Didn’t anyone care we were on vacation? Actually, someone did. A gentleman pulled into the parking lot and invited us in, although they were not officially open for a while. Since they weren’t open there was no food, but you know what he did offer us? A wine tasting. Score! And one of the wines, Traveler, was peach flavored! Not cloying juicy peach, just a hint and it was wonderful. That man single handedly saved our drive through Georgia. So, if you happen to be driving up the I75 past exit 41 be certain to stop in and try a sampling. It was only $5 for 5 samples and a very nice, thick wine glass. I’ll still break it but it may last a couple of months. Try Traveler and Jockey, they were both wonderful. We did finally stop and eat actual food in Georgia, at some Mexican food restaurant. I don’t believe I will ever eat Mexican food in Georgia again. They didn’t even have peach salsa, which I was just certain they would. So sad. Imagine that. I’ve never driven through Georgia, but I agree, peaches should be sold roadside year round. And wine for breakfast sound pretty good to me! Nothing puts you in vacation mode faster! As a reminder for next time, at 9am in Georgia it is 4pm in Europe so nearly happy hour. Also, I just read that red wine gives your heart the equivalent of a workout, so it is good for you! I would be sadly disappointed at the lack of peaches as well. So basically I created my own health and wellness vacation on accident. Score!